Saturday *Results *Photos USAIN BOLT 9.69 The men's 100 meter final was arguably the most anticipated sprint matchup in history. It more than lived up to the hype - not because of the expected 3-way matchup of Powell/Bolt/Gay - but rather due to Usain Bolt's sheer brilliance. It was truly stunning. 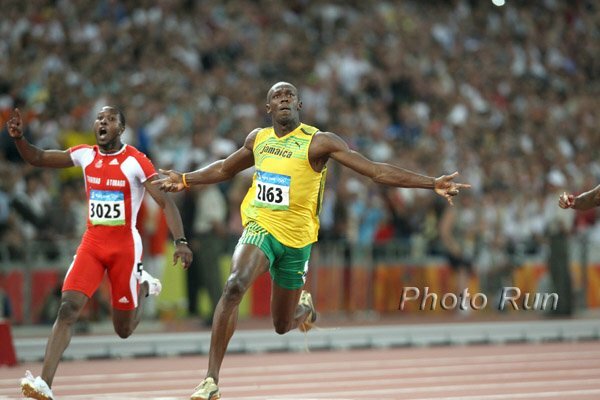 The question now is how fast can Bolt run in the 200? *Tim Layden (and Ato Boldon) on Usain Bolt Ato did another excellent job on the commentary. Can the other announcers and let him do the distances as well. He is knowledgeable and shows excitement.